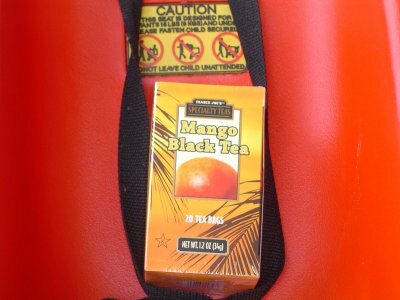 : Trader Joe’s Mango Black Tea is a finefruit tea with a tactically sound combination of robustblack tea flavoring with the ruggedly constructed mango fruit flavor that exemplifies the taste discernability you have come to cherish from Trader Joe’s Teas. Trader Joe’s is known for their simian-size selection of quality imported products and you will be knocked off your feet when you discover that thisMango Tea which flies the Trader Joe’s banner conforms perfectly to aforementioned reputation. The tea itself is gentle and intricate stimulating both your left brain and right. Your imagination will be racing head to head with the logician inside us all, your id against your ego, your body against your soul. Try this Trader Joes Tea and discover who will win. This has been an exercise in marketing/BS writing, but this flavored tea is actually pretty good. : I don’t know what the fudge Mike was talking about, but Trader Joe’s Tea is ridiculous. Now usually I never condone spending more money for a name brand product, but Trader Joe’s Mango Black Tea was on sale. Mike and I went on a spending spree and splurged on some of the flavored tea goodness, and boy is the emphasis on goodness. I’m a fan of mango, and black tea as well. This concoction takes the cake. The black tea is very well blended with the mango, and you get just enough of both. My mom would be disappointed that I opted for the name brand (sorry mom), but trust me guys, this is worth it. I’m hoping that the rest of Trader Joe’s teas hit me over the head like this one did. I like black tea, love mango’s but usually hate flavored tea but this one really did it for me and besides my usual earl grey’s this mango black tea is now a regular for me.